Andy, the owner of Money Mayday Loans, contacted us a few weeks back asking about website design. He started a new payday loan business in Monroe, LA and wanted to have a website created to help his online presence. Andy sent us over a website that he liked and asked his to look similar to with the same feature set. That included a simple online application, a slideshow, six pages, and social networking integration. The website was started just a few days after the initial pre-payment was sent in. Over the two weeks, Andy requested some changes here and there to the site until he was happy with the verbiage and the setup. Today, he approved of the website and we moved it over to his website hosting account. We appreciate the business from Andy! 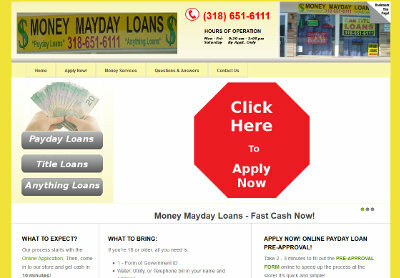 The website for Money Mayday Loans is at moneymaydayloans.com. Matt contacted us over a month ago in regards to getting two of his websites transferred from his hosting companies. The other website was already migrated over to our hosting solutions and setup since he was in possession of the domain name. 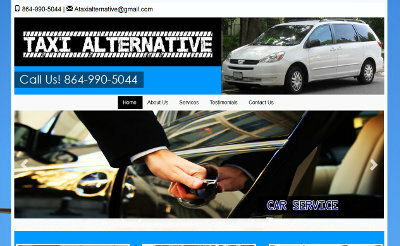 However, his other website, A Taxi Alternative, just was moved over today. He had a great deal of difficulty getting the domain name from his previous hosting company since they never answered their phone or responded to e-mails. Today, he finally was able to get the domain name transferred over to his own account to manage for himself to prevent that problem from occurring again. Matt provided us the details to accept the domain name transfer and set the nameservers on his behalf. His final website has now been fully setup with BsnTech Networks mirrored hosting services. We appreciate the business from Matt! The A Taxi Alternative website is at ataxi.co. Matthew, the owner of Team Mamo Realty, contacted us last week in regards to getting a website created for him. Matthew is in the real estate business and assists customers buy and sell their homes – and also assists landlords with property management and investment property purchases. He had several different websites already for providing information about his services – but he wanted one single source to direct all of his customers to – that way it is easy for them to have all of the links to his various resources in one spot. Originally, Matthew had also just changed from GoDaddy over to Yahoo web hosting services just days before contact us. However, he decided that he wanted BsnTech to manage all of his website needs – including domain name management and e-mail services. He noted that it was very easy to reach out to us – and that we responded to emails quickly. On top of that, we speak English and are easy to understand! He had countless problems with GoDaddy raising his rates and poor customer service experiences at Yahoo, so he opted to make the transition to us. We worked diligently on Matthew’s website and made each change he requested in a timely fashion. Today, he has approved of the website and was ready to launch it! Matthew noted that hew as very pleased with our work and that he had some clients / business partners that were also watching the construction of the site because they were contemplating a website design as well. We are hoping to win those customers as well. We appreciate the business from Matthew! 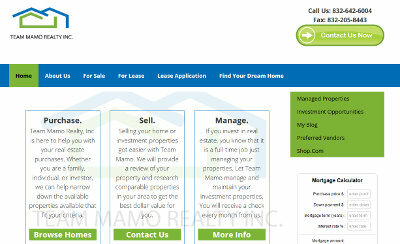 The Team Mamo Realty website is at teammamorealty.com. Brian of BsnTech Networks was contacted by a previous co-worker on Facebook about a website design lead. The individual provided us contact information for a person they were good friends with – and said that they were starting a new business and needed a website setup. We followed up with the potential customer, Kristin, and explained our services and pricing. Kristin said that she knew of a person that could do web design, but they were very busy and she needed to have a website setup immediately for her new business venture – which is in the fitness and nutrition service industry. BsnTech started right away on the site and had something ready for them in just a few days. This was just the beginning – as just a simple site was needed for now. A few weeks later, Kristin contacted us again and said she was ready to add more functionality to the site – namely the ability for visitors to register and pay for events online – and the ability for visitors to purchase a membership to the website to access premium content like meal plans and recipes. We setup the event registration system that lets them manage their events and tailor the events to their needs – all of which is easily displayed on a calendar. They can customize the maximum number of attendees, the cost of the event, discount codes for multiple ticket purchases, and more. With the membership system, we setup one level of membership – VIP level. Anyone is then able to become a member of the site through an automatic recurring payment – then they have additional access to the site. We appreciate the business from Kristin and look forward to providing her support for the site over many years to come! 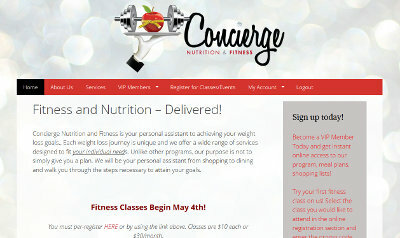 The Concierge Fitness & Nutrition website is at conciergefitnessandnutrition.com. Matthew, the owner of Team Mamo Realty, contacted us last week. Initially, he wanted to get a landing page website together for his customers – that way he could have a single website that would then link out to all of his other pages. During the conversations, he also said that his logo that he created looked very poorly on signs that he used for his properties and anytime that he tried to make the logo larger. That is because Matthew was working with a “raster” logo and not a “vector” logo. Raster logos do not scale to larger sizes – and will look blurry or distorted. They are meant to be the same size – or smaller. With our vector logo design service, we can take a raster logo and convert it to a vector. Matthew took us up on the offer to have this done. The order was sent to our logo designer right away – and he had it completed to Matthew’s expectations in just two days. Now, Matthew can use the logo anywhere – and increase the size of it – without any loss of quality. We are still working on Matthew’s website and should have that finished up soon. LaKeita contacted us last week in need of some help. She requested to have a logo that she made vectorized to put on product materials – and also to ask some questions about getting a website created. LaKeita placed her order for vectorizing her logo design right away and said she would contact us about the website design. Our logo designer quickly worked to vectorize the file – and had it completed with several mock-up variations in just two days. LaKeita was very happy with the fast work that we provided and chose the design that closely resembled the design she made. We appreciate the business from LaKeita! Gary contacted us about a month ago with a request to create an online auction website. He also wanted the ability to allow for fixed-price items, similar to classified listings. Once we got the initial deposit from Gary, we started on the work right away. Initially, the first auction system we chose did not meet the expectations of us or Gary, so we “ate” the cost of this mistake and went to another system that was much more capable with his requests. Even so, Gary had specific features and requests that he wanted to have on the website, which required some custom programming to fully integrate and get working. One of the main aspects that Gary needed was the ability to receive a commission/percentage of any auctions that sold where the buyers did pay for them. He did not want to deal with sellers that may not pay their commission/percentage for using his website as an outlet for selling their products. What we came up with – was the PayPal Adaptive Payments system. This allows payments to be sent to multiple individuals at the same time. In essence, the buyer is sent to the PayPal page to make a payment, and they are automatically paying the percentage to Gary and the balance is then sent to the seller’s account. We also assisted Gary with the integration of some Amazon affiliate banners at the top and bottom of the website. The website has now been completed and has been launched! We appreciate the business from Gary and his patience as we worked through each of the features and customizations that he wanted. 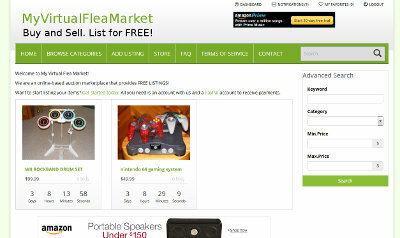 The My Virtual Flea Market website is at myvirtualfleamarket.com. Jonathan, a long-time customer of BsnTech, contacted us in regards to another project that he needed help with. Initially, he started out by attempting to use the GoDaddy website builder – but found it limiting and it prevented him from doing having features on the website that he wanted. Therefore, he contacted us to go ahead and have us take the reigns with his website design, website hosting, and domain name administration. The website was setup and created and a fully separate mobile site was developed. After Jon had a moment to think about the site, he opted to scrap the site and start over with “TimeVine Version 2” and provided us newer, updated direction on the site. With this new site, we recommended that both the desktop and the mobile version of the site be built in one – instead of having two separate sites. That way, there was no need for mobile redirect scripts and any changes that were done on the site would immediately be updated on the mobile version as well. He liked this idea and we made it happen. Today, Jon has approved of the site and is exceptionally pleased with how it turned out and the guidance we provided during the process. We appreciate the continued business from Jon! 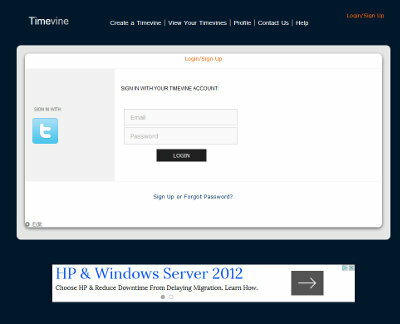 The TimeVine website is at timevine.co. Mina contacted us last week asking for help with a website design. She already purchased her domain name and website hosting – and then tried to setup her own WordPress site. However, she was not satisfied with how it looked and opted to reach out to a professional website designer. We called Mina back and she noted that another individual already had replied to her request and said that he was working on it. However, we spoke with Mina for a while on the phone and she really felt like we understood what she wanted and felt that our level of professionalism surpassed the previous person that she spoke with. She noted that there were language barriers with the previous person because they were from a different country. In the end, Mina provided us with the login details for her site and requested that we change the password right away – to lock out the other person from making any changes to her site. Mina sent us the information she wanted on her website by the end of the night. The next morning, we started working on the site and had it completed in one day. She was extremely pleased with our response and the fact that her site looks very professional for her field. She has noted that there may be some other websites that she would like to have us create in the future – specifically because she was astounded by us understanding what she wanted to do with the website and our timely work that was completed. The website for Life Coaching by Mina is at affordablecertifiedlifecoach.com. Luigi, a long-time customer of BsnTech Networks, reached out to us about a month ago letting us know that he needed to have another website setup for some more books he has published. He also needed a new domain name and website hosting account. Luigi just sent us the information to start on the site last week for his two-page website design. It included several pictures of book covers and dozens of PDF files to link. In addition, he wanted to integrate PayPal for donations. Today, Luigi has just approved of the site and has called it ‘complete’. 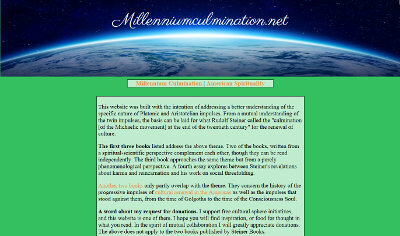 His website details several books that he has written along with a synopsis of each book. Some even have a free eBook download from the site. We appreciate the continued business from Luigi! Luigi’s new website is at millenniumculmination.net.